We haven’t read the novel, Fried Green Tomatoes At The Whistlestop Cafe. But in the film, while green tomatoes are fried up, we (a northerner and fan of heirloom tomatoes) missed a technical point. We didn’t realize that the green tomatoes were fried because they were not yet ripe. Plucked off the vine green (photo #2) and dredged in cornmeal, they were a treat. 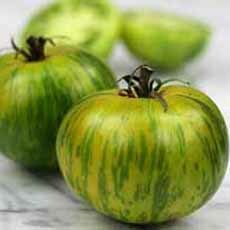 We initially thought that they were Green Zebra heirloom tomatoes (photo #1). Fried green tomatoes are typically served as a side dish; in the South, with fried chicken. We enjoy them with grilled chicken and fish. We’ve been adding them to grilled cheese sandwiches, too, and highly recommend it. When fresh red tomatoes aren’t great—which is the case for much of the year—fry them up and add to green salads. 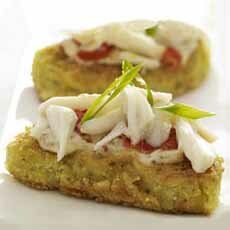 McCormick serves fried green tomatoes with buttermilk chipotle dressing, or topped with lump crabmeat and Creole mustard—a nice first course. Ready to fry some green tomatoes? This is the classic southern recipe (photo #3): buttermilk, cornmeal and green tomatoes (photo #2). Use a heavy skillet. Some recipes we’ve read recommend the even heat of an electric skillet. 1. COMBINE the egg and buttermilk; set aside. 2. COMBINE 1/4 cup all-purpose flour, the cornmeal, salt, and pepper, in a shallow bowl or pan. 3. DREDGE the tomato slices in the remaining 1/4 cup flour. Dip in the egg mixture and dredge in cornmeal mixture. 4. ADD the oil to a large cast-iron skillet, to a depth of 1/4 to 1/2 inch. Heat it to 375°F. 5. DROP the tomatoes, in batches, into the hot oil. Cook 2 minutes on each side or until golden. Drain on paper towels or on a rack. *Some recipes add bacon grease. If you have it, substitute three tablespoons bacon grease for an equal amount of oil. Don’t want to fry your tomatoes? 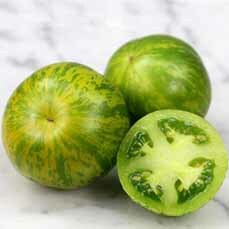 Then treat yourself to the gourmet’s green tomatoes: Green Zebras (photos #1 and #6), in a tomato salad. And, use the salad as a garnish for French Toast. Save the maple syrup for post-tomato-season. Look for Green Zebras in farmers markets. The season is fleeting, so enjoy as many of these (and other heirloom tomatoes) as you can. 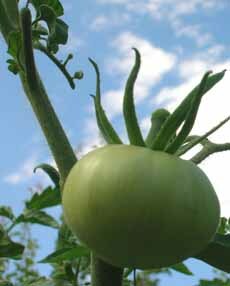 Heirloom Green Zebra tomatoes, which remain green when ripe, are not meant to be fried, but to be enjoyed raw (photo courtesy Rare Seeds). Green tomatoes that have not yet ripened to red are used to make fried green tomatoes (photo courtesy Chrissi Nerantzi | SXC). 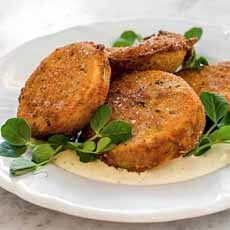 Cornmeal + tomatoes + skillet = fried green tomatoes (photo and recipe courtesy McCormick). A first course: fried green tomatoes with lump crab and mustard sauce. Here’s the recipe from McCormick. 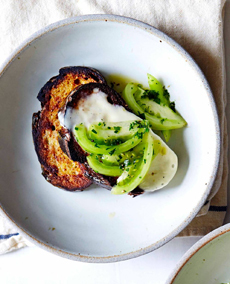 Top French Toast with a green tomato salad (photo courtesy Quinciple). Use Green Zebra heirloom tomatoes for a salad…including atop French Toast. 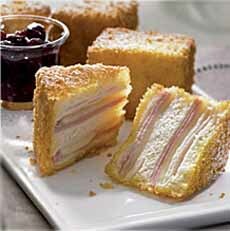 Monte Cristo sandwich (photo courtesy Kikkoman). This recipe is actually a grilled cheese hybrid. Instead of brushing bread with butter before grilling, the bread is dipped in “French Toast” batter: eggs and milk. Serve it for breakfast or lunch. 1. WHISK the eggs, milk, hot sauce and salt and pepper to taste in a shallow bowl. Dip each slice of bread into the egg mixture on both sides until fully coated and set aside. 2. HEAT the butter in a large pan over medium heat and add the bread slices, cooking until golden brown. Flip the bread and cook on the other side until golden brown and cooked through. 4. TOSS together the tomatoes, parsley, chives, olive oil, vinegar, shallot and seasoning to taste. Divide the French Toast between two plates and top with the tomato salad. The dish known in America as French Toast has roots at least as far back as ancient Rome, where it was a sweet dish. In fact, pain perdu (lost bread), the current French name for the dish, was once called pain à la romaine, or Roman bread. While the story evolved that French Toast was a food of the poor, trying to scrape together a meal from stale bread—and that may also be true—recipes from ancient and medieval times denote that it was fare for wealthy people. Recipes used white bread, a luxury affordable only by the rich, with the crusts cut off. Poor people ate brown bread, which was much cheaper because the wheat endosperm did not have to be milled and painstakingly hand-sifted through screens to create the vastly more expensive white flour. When the wealthy discovered how tasty the dish was, costly ingredients such as spices (cinnamon, cloves, mace and nutmeg), sugar and almond milk appeared in the batter of numerous recipes. The cooked bread was topped with costly honey or sugar. Thus attests old cookbooks. Cookbooks themselves were the province of the privileged: Only wealthy people and the clergy learned to read. More recently, French Toast has evolved into a savory sandwich, the Monte Cristo. It is an evolution of the croque-monsieur, a crustless sandwich of ham and Gruyère cheese, buttered and lightly browned on both sides in a skillet or under a broiler. The Croque-Monsieur was invented in Paris in 1910. A variation with a baked egg on top is called a Croque-Madame. Neither sandwich was battered, like French Toast. The Monte Cristo sandwich (photo #7), a triple-decker sandwich, battered and pan-fried, was invented at the Hotel del Coronado in San Diego. According to the L.A. Times, the first recipe in print is in the Brown Derby Cookbook, published in 1949. Here’s the recipe so you can try it for lunch—although probably not on the same day you have French Toast for breakfast.